Gotcha! I bet you thought we would take you a trip through the beautiful capital of New Zealand. No we are not going to tell you about Wellington in New Zealand, rather we are here to explore the laid-back, sleepy town of Wellington in Tamil Nadu! 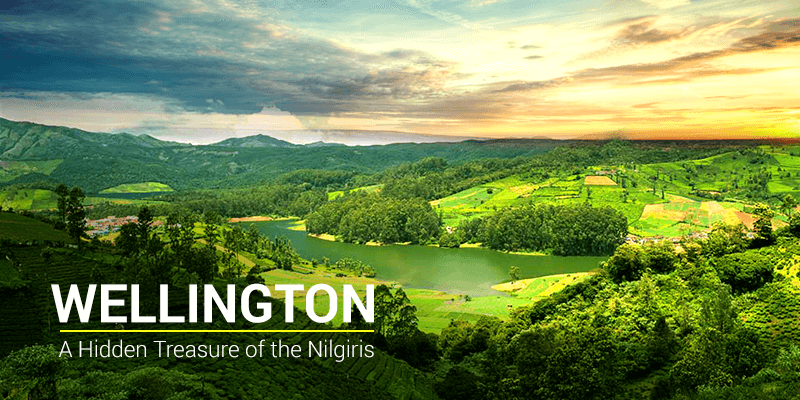 Nestled in the stunning hills of Nilgiris, Wellington near Ooty is a perfect all-weather holiday destination for travelling buffs. The World Heritage Nilgiri Mountain railway chugs silently past this scenic town taking tourists towards the Tamil Nadu tourism hub of Ooty. But, with Ooty becoming a crowded hill station (due to high influx of tourists), many tourists are today searching for their own secluded wonderland. And Wellington is the answer to such travel desires. Wellington is situated some 16 KM away from the tourist town of Ooty. This town has a perfect weather all through the year. It is blessed with a great collection of flora and fauna. 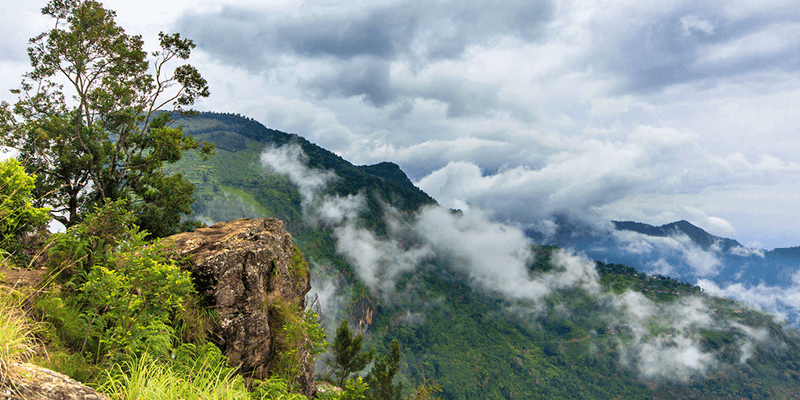 Small hikes from Wellington to Nilgiris, offer splendid mountain views. Time seems to have stood still at this old British Cantonment town and that is exactly why Wellington has a distinct British town feel about it! Being the adjacent town to famous hill station of Conoor, famous for its tea gardens and breathtaking scenery, Wellington has become an ideal base camp destination for viewing the splendors of Tamil Nadu’s hill stations. So, let us take you on a tour through the tourist places in Wellington. Ideal way to reach Wellington would be to catch a cab from Coimbatore (72 KM away). The highlight of this journey lies in the beauty of the roads. 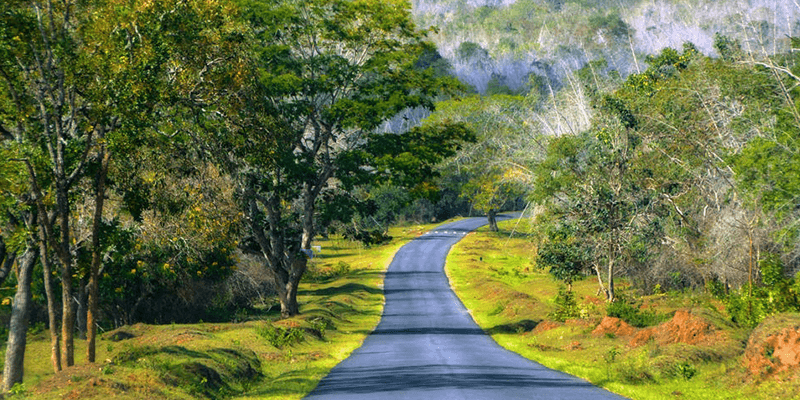 Filled with hairpin bends and beautiful scenery all around, the road takes you through forests, tea and coffee plantations, beautiful streams and spice gardens. 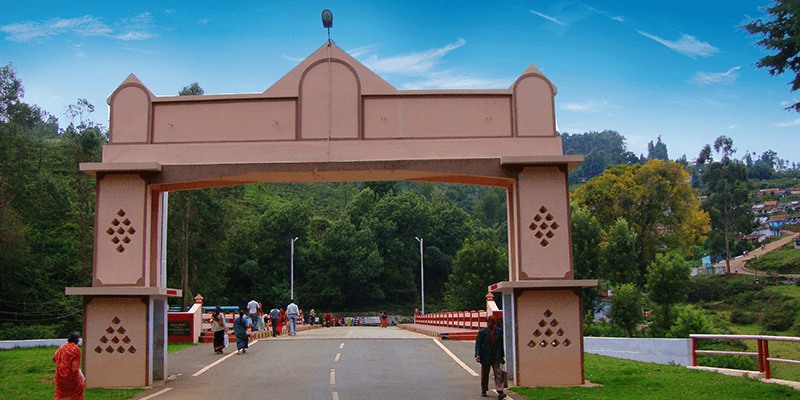 Black Bridge in Wellington is a historic bridge lying on the Ooty-Coonoor road. It was first built in 1858 to connect the two nearby hill stations. In its initial days, the bridge was made of original Burmese teak wood and was painted in Black. And hence it picked up the name – Black Bridge. The bridge is situated over River Mynala and serves as a great vantage point to enjoy the lush greenery of Wellington. Over the years the bridge has been re-built many times due to wear and tear. After the recent reconstruction, the bridge was renamed as Manekshaw Bridge after the legendary late Field Marshal Sam Manekshaw (former Chief of Army Staff who led India to victory in Indo-Pak war of 1971). Sam Manekshaw settled in Wellington after retiring from military service. 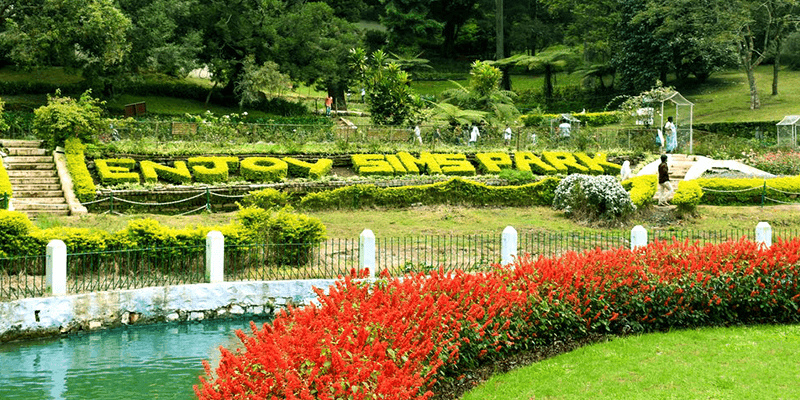 Situated on the hilly terrain of the Nilgiri range, Sims Park is one of the most beautiful parks in Tamil Nadu. This park spreads over an area of 12 hectares and is decorated with ornamental flower beds, lush lawns, winding footpaths over the slopes and many other plants of unusual species that were imported from various parts of the world. There are more than 200 rare varieties of plants within Sims Park, there is also a special glass housing where ornamental plants and flowers are kept. This artistically laid out park was developed in 1874 and named after JD Sims. Trivia: An annual flower and fruit show is held here every year in May. 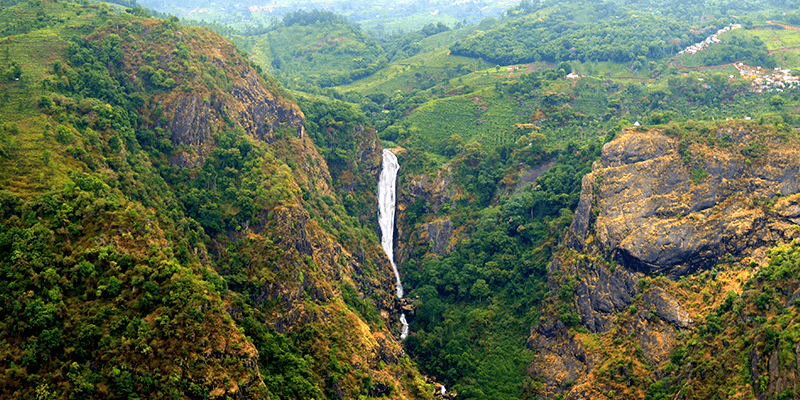 Catherine Falls is the second largest waterfall in the Nilgiris! Water at Catherine Falls cascades down from a height of 250 feet, creating two waterfalls in the same place. The waterfall is created by River Kallar, which descends down from rocks as a stream. The waterfall is named after Catherine Cocburn, who introduced coffee farming in these parts. The waterfall lies in the midst of dense forests, tea plantations and the Mettupalayam plains. You can get a great view of the beautiful town of Aravenu from this waterfall. A journey to the Catherine Falls is an unforgettable experience, where you pass through Pine forests and many tea gardens. Tip: One has to trek for 2-3 KM from the main road to reach the waterfall. So, wear comfortable foot. Situated at a height of 5000 feet above sea level, Lamb’s Rock is a popular tourist attraction near Wellington. This rock is jagged out from the cliffs and is often hidden away by the cotton clouds. 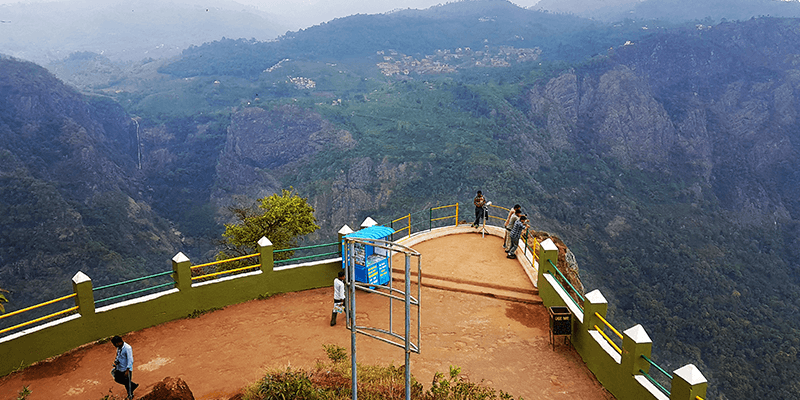 On a clear day, the Lamb’s Rock offers panoramic views of Coonoor city and all the forests in the vicinity. The place is named after one Captain Lamb who developed this area. A road trip from Wellington to this view point is filled with thrills. You pass through the scenic tea and coffee plantations to fall into a forested area. And guess what, the forest roads offer a high chance of spotting elephants! Lamb’s Rock also offers great views of Hulical ravines and Coonoor stream. Trivia: In the past Lamb’s Rock became infamous as a suicide point after certain mishaps. Must taste: There are many popular tea shacks along the route (from Wellington to the viewpoint) and these serve various attractive flavors of tea such as chocolate, cardamom, peppermint and masala tea. Do care to taste! Shopping: You can stop by the road and shop for really good spices and tea. Situated at over 1500 meter above sea level, Dolphin’s Nose is a must-visit for those who love clicking great pictures. The view point protrudes out from the cliffs and it appears like the tiny yet pointed nose of a Dolphin. Someone just spotted that and the place was named Dolphin’s Nose. One can stand on this enormous rock and enjoy the views of Catherine Falls and other ravines flowing below. The viewpoint is set amidst plenty of greenery and on most days Dolphin’s Nose is decorated with those white clouds. Now, talking about the journey to this viewpoint, one would pass through beautiful coffee and tea plantations and often past some fragrant spice gardens. Tip: You can easily find restaurants run by the tea plantations, along the road. These restaurants offer free tours of the tea factories. You get to see all the steps involved in preparing the perfect tea leaves. If you are planning a visit to this beautiful hill station, do use the travel services of RailYatri to make your trip hassle free. Wellington is one of my most favourite holiday destinations. This blog brought back many memories of the time I spent there. Nicely worded and very informative. Kudos to the writer. Plain, simple and nicely worded piece of writing. Makes me feel like going there. I guess even the New Zealanders would love to discover a place such as this!